The Avengers: Age of DULLtron. Get ready for the first big movie to usher in the summer blockbuster season. Only, you will probably find you enjoyed the first Avengers better. Writer-Director Joss Whedon returns with the highly anticipated sequel to the 2012 smash hit. The Avengers: Age of Ultron is a mesmerizing, overly stuffed science-fiction/fantasy that will, in the end, leave you hungry and unsatisfied. Unlike the previous installment, this flashy yet underperforming sequel lacks satisfying plot development. It’s almost as if the movie is at its climax the entire time, with no apparent windup, little exposition, and nearly non-existent rising action. There are movies that are two-parters that have no business being split, and there are others that are one-movie that desperately needed its story to be told over two films–this is the latter. There was such potential in the story, but the plot was executed poorly. If the writers paid more attention to and spent more time on plot development and less time on funny one-liners and running jokes, which are quite appropriate and help keep the dialog balanced, then we may have had a better movie. The Avengers: Age of Ultron takes us on an a high energy journey around the world from Eastern Europe to Africa to New York City. At the center of the movie is a once-dormant peacekeeping program initiative that was designed by the brilliant engineer Tony Stark (Robert Downey Jr) that was inadvertently activated and developed an artificial intelligence of its own with a dark vision of what peace should look like. Taking to the internet, the AI peacekeeping program (aka Ultron) is everywhere and nowhere all at the same time. 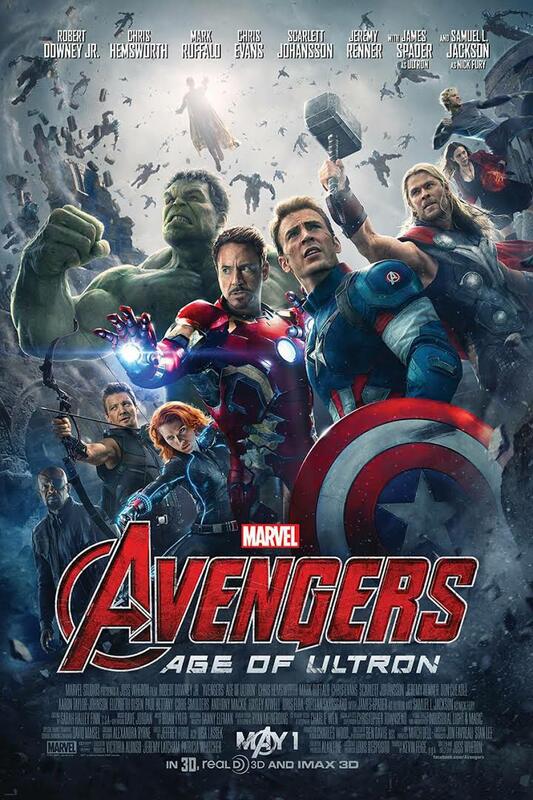 Teaming up with Captain America (Chris Evans), Hulk (Mark Ruffalo), Thor (Chris Hemsworth), Black Widow (Scarlet Johansson), and Hawkeye (Jeremy Renner), Iron Man and the Avengers must overcome personal differences and ban together to confront the peacekeeping initiative that is hell-bent on destruction. Ultron, along with other enhanced humans designed by Striker will prove to be the most daunting enemy faced by our heroes, and will have to work together like they have never done before to save the world from catastrophe. Sounds like a great movie right?!? Well, not so fast. As I mentioned in my opening paragraph, the movie truly had great potential and, despite its short comings, has a phenomenal cast. But, the story structure and well-crafted writing just wasn’t there. The plot is quite dull. It really is almost as though this was a glorified filler movie to make way for the next installment Avengers: Infinity War Part 1. From a technical perspective, the film is fantastic! The special-effects, practical effects, and CGI were woven together seamlessly. Both the cinematography and direction demonstrated a true gift for telling a story visually. And, to that, I applaud the filmmakers for a commitment to visual storytelling. With the exception of the casting of Maria Hill, a role better suited for Anne Hathaway than Cobie Smulders, the cast was once again brilliantly selected and truly brought the iconic comic book characters to life for the silver screen. The additional roles of Quick Silver (Aaron Tyler-Johnson) and Scarlet Witch (Elizabeth Olsen) were also cast impeccably. And I do not feel anyone besides James Spader could have brought such life and incarnate fear to the voice of Ultron. Before I tackle the shortfalls of the plot, the character of Ultron needs to be examined. Most any competent filmmaker, or more specifically screenwriter, will tell you that a well-developed story needs a protagonist with a well-defined external goal (often accompanied by an internal goal), and in this respect this film checks that box off; however, a screenplay–especially one of this genre–needs a well-defined antagonist with both an external and internal goal as well. And in addition to the goals of the antagonist, we also need to love or love to hate the villain. Knowing WHY the villain/antagonist does what he or she does is paramount to proper character development. Unfortunately, the audience is not told why Ultron hates humanity so much, unless you count the CNN footage Ultron quickly scrubs through in his rushed genesis. It is never a good idea for a writer-director to just expect the audience to accept the actions of the antagonist without explanation or reason. Not knowing why Ultron is determined to create peace by destroying humanity without reasonable exposition does not create a well-developed character. Whether dealing with a protagonist or his/her opposition, it should never be expected for an audience to engage in blind acceptance. Here’s where the plot went wrong. Now, in order to critique the plot, it is unfortunately necessary to reveal information that may, but not necesserilly, spoil the movie for those who are unfamiliar with the story or the comic book series. But, I will do my best to not reveal too much. At the center of the movie is this dormant peacekeeping AI initiative designed by Stark Industries called Ultron. Funny how it was never acknowledged in the previous film and came across as a plot gimmick just to hurriedly explain the vague origins of Ultron. The simple and elementary observation of the disregard for proper story structure is evident through the fact the movie lacks an adequate introduction and development/rising action. We basically go from a rushed first act and touch on the second act, then skip directly to a bloviated third act. Where’s the windup? Not here. Being a science-fiction movie, that means that certain laws of science should be adhered to in order to increase the believability and sell-ability of the story. Most anyone who has taken a science class in middle or high school knows that the higher the elevation, the lower the oxygen level, the lower the oxygen level, the slower the brain functions and the more mitigated the functionality of the lungs. I just don’t buy the fact that no one suffers from high altitude sickness when the Eastern European city hangs in the atmosphere above the mountains. The lack of oxygen isn’t even mentioned at all. Even if you buy the fact that the Avengers have somehow overcame this physiological obstacle, the citizens of the city are certainly bound by normal human respiration and circulation. Over-all the movie is exciting and, despite its shortcomings, is a perfect movie to usher in the coveted summer blockbuster season. It is the first of many highly anticipated summer movies including Disney’s Tomorrowland and Universal’s Jurassic World. Hopefully the next installment in The Avengers series will make up for the structural and logical fallacies in this movie, and spend more time on the writing for the next one. Whether you’re a comic book or super hero fan or not, this is definitely a movie that will add excitement to your weekend. And, for those that are graduating this weekend and next, this film makes for a great way to start a weekend of parties and celebrations.